Cooking with Champagne – you’re gonna love it! The word champagne makes most people think FUN, party, celebration, romance, giggle, kiss, Woo Hoo!! Just the sound of the cork popping makes your eyes open wide and your heart fill with happiness. Cooking with champagne is even more exciting! One of the classes I attended this past week was for food of the Champagne region of France. The only place from which sparkling wine can legally be called Champagne according to the French. Every dish in the menu has champagne in it and let me tell you – each is absolutely FABULOUS! 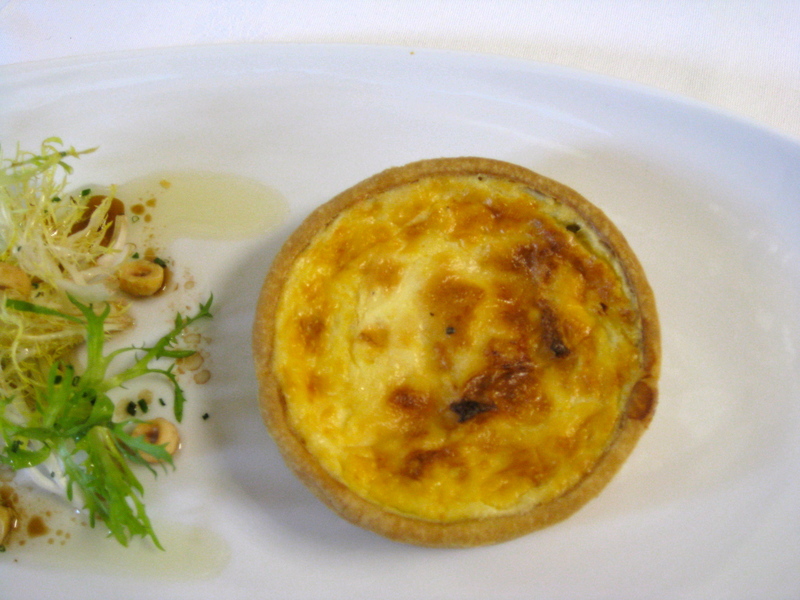 The starter is a Leek and Chaource Cheese Tart. Chaource cheese is also from the Champagne region and looks like a thick brie cheese. It has a stronger flavor than brie but not quite as strong as camembert cheese. The tart is made with a short crust pastry which is pre-baked slightly. Leeks are diced and softened in champagne and butter then they line the bottom of the tart shell. The cheese is sliced and fanned out over the top of the leeks beautifully leaving gaps for the filling. The filling is made with eggs and heavy cream and poured over the top just to come to the top of the cheese. Once baked it is creamy, yummy, delish! – and when you eat it the cheese oozes out to add to the creamy texture of the filling. When I tasted it in class I made the “mmmmmmm” sound much to my embarrassment as I saw the other students look my way with amusement. 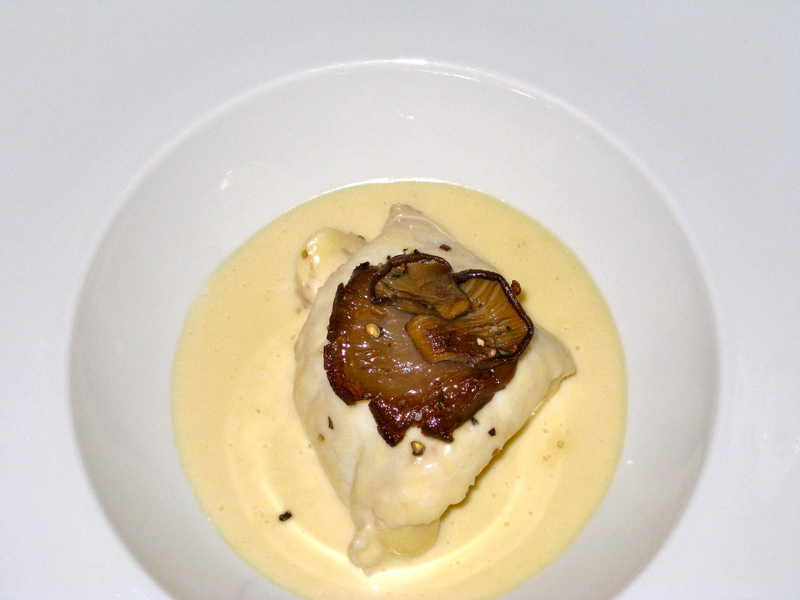 The main course is Fillet of Sole stuffed with a Whiting mousseline. It is rolled into a pipe shape and poached in stock or in water then served with a Champagne Beurre Blanc sauce. Beurre blanc is a heavenly white butter sauce usually made with butter, shallots, white wine and vinegar. In this case, it’s made with champagne. The milk solids from the butter get suspended with the acids from the champagne and vinegar which creates a thick and creamy texture. A little fresh champagne is added to the sauce just before serving so there is fresh flavor and some effervescence. Let me just tell you, I am not usually a fan of fish. I could eat this dish EVERY day!! It’s that good. The sweetness from the butter and the cream balanced by the acidity of the shallots and the champagne along with the slight effervescence and the saltiness from the fish stock creates a taste sensation in your mouth that is transformational. OOOOO la la la la la la as they say in Paris! 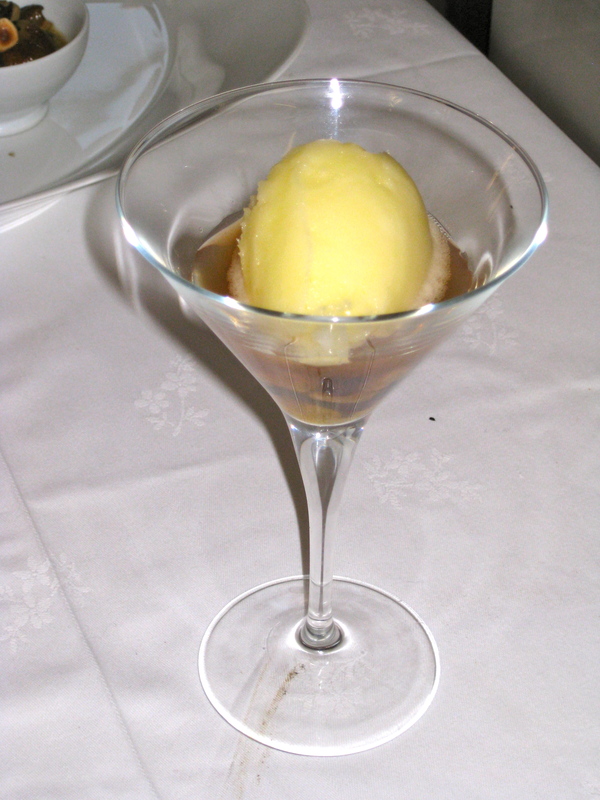 For dessert we have Champagne sorbet scented with lemon and orange accompanied by orange scented Madeleines – VERY French and VERY tasty. A light, tasty perfect ending to a fabulous meal. And yes, there is some champagne in the Madeleine batter. I often use champagne when I’m cooking at home. Sometimes I open the fridge to grab some white wine to add to a sauce or roasting dish; even to vegetables I’m sautéing. Many a time I have grabbed an open bottle of champagne instead of the white wine and I have always been please with the result. Now I know at least ONE of my friends is saying, “leftover champagne?! Quell dommage! Who would have leftover champagne! !” It does happen from time to time… Try it – you’ll love it! Wonderful. A question for you. You mention orange scented madeleines are served with the sorbet. Are they delicate cookies, or crackers? The photos are very helpful to understand how these various courses are presented. This is really art in it’s purest form ! Hi Dave, the dishes look divine! What atop the sole? Sautéed ‘shrooms? I make onion tarts often, especially in the winter. What are the classic proportions of eggs to cream/milk? Did you flavor the custard with a little nutmeg and white pepper? Ah, the thought of champagne first thing on Saturday morning . . . I’m already planning dinner for tonight! Yes those are sautéed oyster mushrooms adorning the fish. There is nutmeg in the sauce but no pepper. There was enough of that flavor from the stock. When using reduced sauces, it’s recommended to check for seasoning at the end as the evaporation of half of the liquid will make the salt and pepper stronger. I just realized that reading your blog is a bad idea when one is hungry! I often cook with white wine, but never champagne. I can’t wait to try it, with a glass on hand for encouragement! Your photographs are beautiful.